Hilde, an elderly Nord citizen, is the mother of local bard Sven; they share a house in Riverwood. She dislikes "cats, lizards and elves", in particular Faendal, who rivals her sons love affair with Camilla Valerius. She wears a set of farmer clothes, including a pair of boots and a hat. She carries an iron dagger, a respawning red apple, the house key and a variety of common loot and gold. She will then return to her regular routine. She sleeps in the house every night between 10pm and 5am and starts the day with cooking and eating breakfast. At 9am she goes outside and spends the entire day on the porch, interrupted only by a one-hour meal at 6pm. At 8pm she heads back inside for a bit of relaxation before bedtime. When approached, the old lady will grumpily greet you with, "By Shor, what do you want?" When talked to again, she will say, "It's my boy Sven you need to listen to. He sings at the inn, most every night." and will continue with, "Sven has the voice of a snow lark. Only good thing he got from his father." She will then describe Sven's troubled romance with local merchant Camilla Valerius, saying, "My boy fancies that Camilla Valerius. She'll come around soon enough." but will proceed to describe another of Camilla's admirers, namely Faendal with, "Camilla, I've seen her talking to that Faendal. Filthy elf needs to keep to his own kind..." If you are playing as a human or Orc character, she will then share her views on other races: "What happened to my Skyrim? Everywhere you look, cats, lizards and elves. It's sickening." She will end with, "I raised my Sven to be strong, and proud. A true Nord." Should you talk to her after her dragon conversation with Sven, she will keep going with, "Nobody believes me, but I tell you, I saw a dragon!" 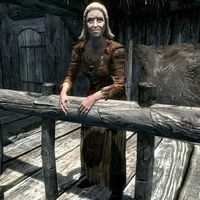 She may also hint you towards the Riverwood Trader with: "Did you hear? The Riverwood Trader was robbed! Poor Lucan must be torn to pieces over it." Hilde: "Has my son Sven asked to join the war?" Hilde: "If he does, tell him how bad the food is. And how dangerous it is." Guard: "Look old woman. If your boy wants to learn how to fight, we'll teach him. Now off with you."